Kids and Moms at work packing relief goods. Moms can always be relied on for everything and anything. This time moms can also be relied on to mobilize a group of, of course, moms (and yes, some dads too) to help this week's flood victims who badly need assistance. M.O.M.S. (Moms on a Mission to Serve) started when a group of mommy friends, spearheaded by my supermom friend, Cheryl Gatchalian, decided to help in their own little way during the typhoon Ondoy. Last Ondoy, M.O.M.S. was able to reach 3,000 families. 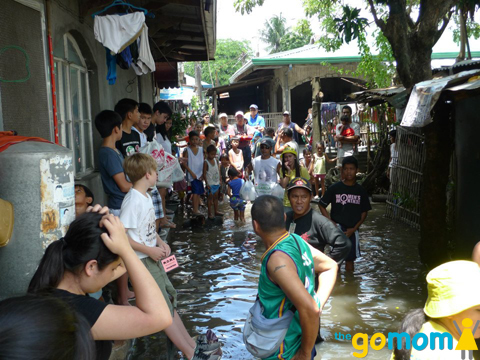 This time for typhoon Gener, M.O.M.S., thanks to all donors, will be able to help 5,000 families. Cheryl's call for help came last rainy Tuesday and truck loads of goods has been pouring since then. Donations came in big and small forms. From cash donations, one box of noodles to 60 sacks of rice plus a truck to distribute the goods. And the volunteers / donors, concerned parents of Xavier, ICA, Everest, British School Manila and International School Manila along with their little tots. Moms and kids distributing goods in flood stricken Sta. Rosa, Laguna last Aug 11 2012. Cheryl said the goods are distributed in coordination with Red Cross. Red Cross pinpoints an area that badly needs assistance and the MOMS team goes to that area with their volunteers to distribute. 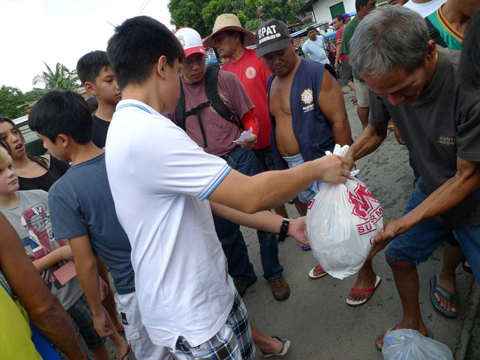 Red Cross together with the local officials will already distribute stubs to the victims to allow for an orderly distribution. Super kind and generous Cheryl in action with some students. 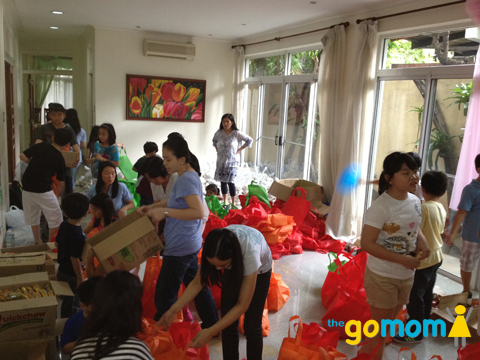 What I love about MOMS is that even the kids are called to help in packing the relief goods and in distributing them. You could see kids as young as 5 eagerly helping pack. It is a very good way of developing empathy, generosity and service among our young. My kids had fun packing the rice and for that day we packed 1,100 packs containing 2kg rice, 6 noodles, 6 canned goods and 4 bottles of water for distribution Saturday to Sta. Rosa, Laguna. The goods are packed in reusable eco bags which a parent donated. Repacked sack after sack of rice into 1,100 bags of 2kilo rice bags. Cheryl so selflessly turned her home into a relief packing center as parents along with their kids, came to help pack. Cheryl foresees relief operations together with some medical missions to go on for a month. Driven by the spirit of compassion for the flood stricken victims and the generosity of all parents, M.O.M.S. is inspired to reach more people and help one family at a time. Donations in cash or in kind (food and medicines for flood related diseases are badly needed), are still very much needed by M.O.M.S.. There are still a lot of our fellow Filipino people who need our help and care. I really hope TheGoMom readers can reach out a hand. Thanks! People still need YOUR help. Please contact M.O.M.S. Thanks! Outbreak Manila, BGC Jul 2012: Horrifying Fun Event! Good job for the M.O.M.S. operations during the habagat floods. This was a good exposure for Lance, Gabe and the rest of the children who helped. Truly, they are men and women for others! God bless! Hi mr. tuscano! It’s very nice to hear from you:-) M.O.M.S. is really a good exposure to the kids and us moms too. It’s a good way to reinforce Xavier’s teaching of being a man for others plus it also helps them to be more appreciative of their many blessings. At this time of continuous calamities, we can’t simply live in our comfort zone and ignore the many needs of other people. Ad Majorem de Gloria!